It’s time to explore what it takes to be competitive in one of the most popular professional sports in the United States — NASCAR. Racing as far back as he can remember, at just 19 years of age Landon burst onto the national scene as the 2008 NASCAR Nationwide Series Rookie of the Year. In 2013, he broke the track record at the famous Gresham Motorsports Park track. Now 25, Landon pilots the #40 Chevrolet SS for the Hillman-Circle Sport LLC team and the #01 Flex Seal Chevrolet for JDMotorsports in the NASCAR Nationwide Series. Beyond Will Ferrell’s turn in Talledega Nights, NASCAR (make that auto racing in general) is a world I know close to nothing about. So it was really fun to sit down with Charlotte-based Landon to explore his personal story; the very specific and peculiar culture of NASCAR; what it really takes to professionally toe the line at prestigious races like the Daytona 500; and how diet and triathlon have come to play a crucial role in Landon’s daily success equation. Extremely likable and humble beyond expectation, I think it’s fair to say this Iowa-bred young man is a fine living example of solid midwestern values and what can transpire when lifelong passion meets true drive, keen focus and a Malcolm Gladwell-esque 10,000+ hours of very hard work, sweat and determination. On May 24, Landon will be racing the Coca-Cola 600 at Charlotte Motor Speedway. After competing in NASCAR’s longest and most challenging test of man and machine, Landon will pioneer an entirely new form of endurance multi-sport when he jumps out of his car post-race, laces up his running shoes and tacks on an additional 14 miles for the day with a run from Charlotte Motor Speedway to the NASCAR Hall of Fame. The Cassil 614 will kick off Snap Fitness’s “Snap Serves” summer campaign, which honors those who have served in the military and encourages people around the country to start their fitness journey. 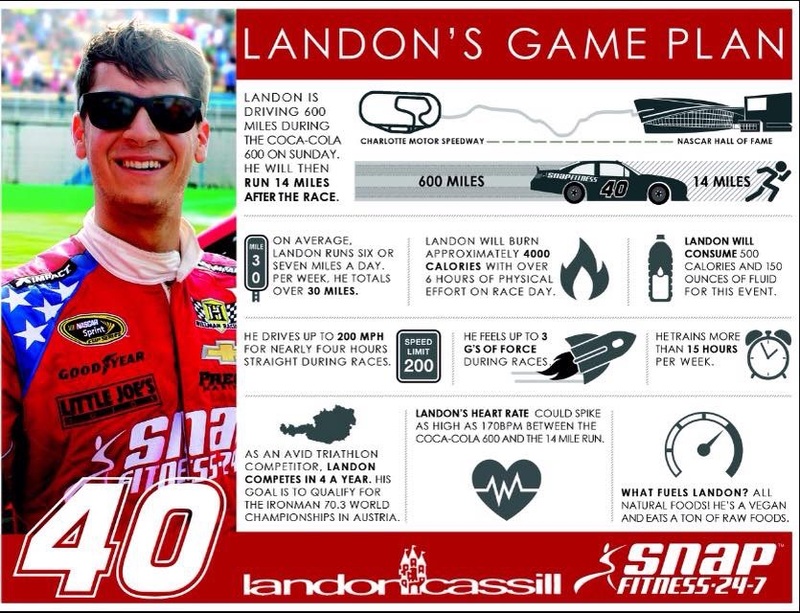 Between now and Landon’s big day, do me a solid and let’s pump him up for this challenge by giving him a supportive shout out on Twitter at @landoncassill. I genuinely hope you enjoy this glimpse into the passionate life of Landon Cassill — my version of Talledega Nights. Production, music & sound design by Tyler Piatt. Additional production by Chris Swan. Graphic art by Shawn Patterson. I Love NASCAR song by Cletus T. Judd. Images of Landon by NASCAR photographer Nigel Kinraid.